We met Pam through Barbara Gold and David Rosenthal of Mission Branding in Guilford, CT.
Pam needed some updated photos of her existing line of yoga bags and she wanted to highlight their style, craftsmanship, durability, spacious size, and multiple uses. Our goal was a clean look so we chose a bright white background, and used a piece of transparent acrylic as a base to create a subtle reflection. Pam was also willing to model and came equipped with matching yoga wear! 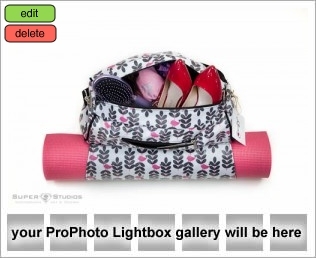 About the bags… “This fashionable bag really does it all, and it’s not just for yoga. Designed and made in the USA it is eco-friendly, water resistant and stylish! The exterior fabric is made from recycled plastic bottles (RPET), and is printed using an AirDye water and energy conservation print technology. The lining is treated with a fungus retardant finish. 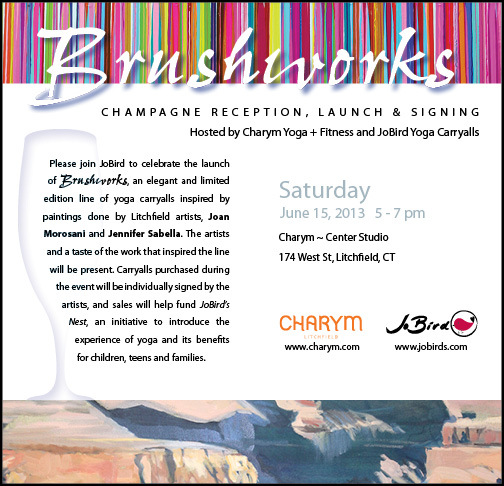 As an added bonus, Pam hired us to design an e-vite and postcard for Jobird’s upcoming event called “Brushworks” … A Champagne Reception, Launch & Signing Hosted by Charym Yoga + Fitness and JoBird Yoga Carryalls, to celebrate Pam’s NEW line of yoga bags that will feature the artwork of local Litchfield, Connecticut artists, Joan Morosani and Jennifer Sabella.